Here you'll find what the Dutch call klein maar fijn (small but good): a 17th-century canalside house with individually decorated rooms and a charming café overlooking the canal. There is no 24-hour reception, but you'll be provided with a key so you can come and go as you please. 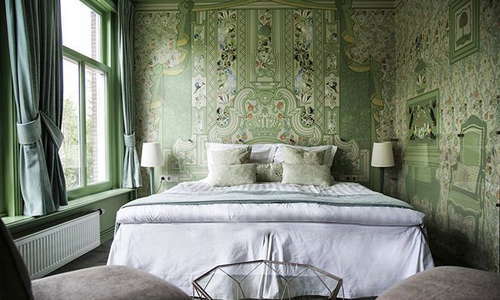 No two rooms are alike, with themes ranging from whimsical floral to Art Deco inspired and riffs on Delft Blue. Larger-than-average for Amsterdam, the guest rooms also offer modern amenities such as flat-screen TVs, air-conditioning, and free WiFi. Rooms in the front overlook the canal, while those in the rear are blessedly quiet. Modern and clean, with simple white and black tiles and walk-in showers with shower curtains. YOU SHOULD KNOW The linens could do with an update. There isn’t one. 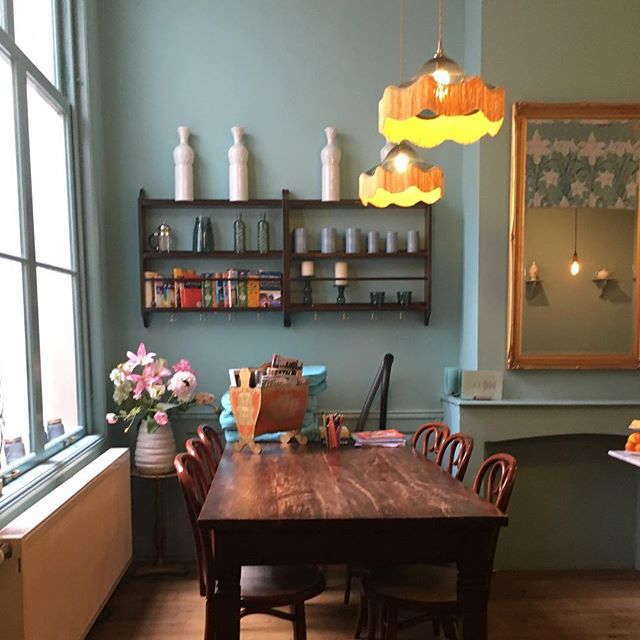 You simply pick up your keys (and perhaps some coffee and cake) in Salon de Thé tea room. 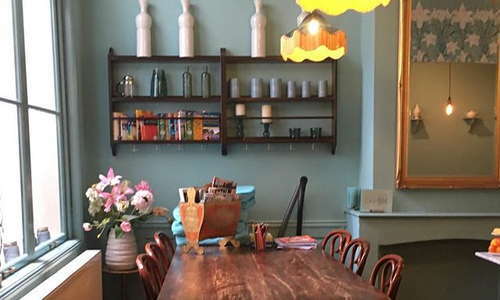 Breakfast and lunch are served in Salon de Thé, a charming tea room overlooking the canal. Breakfast (included) is a simple yet effective Continental offering with sweet and savory items, including eggs, cereals, yogurt, bread and a croissant. There is no on-site bar, but coffee and loose-leaf teas are available in the cheerful breakfast room/lounge throughout the day. 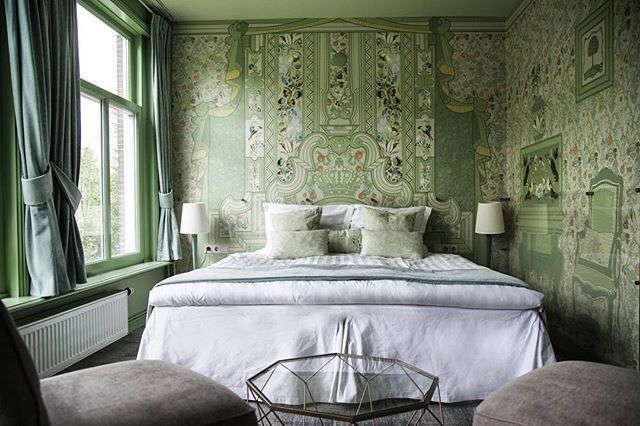 Located on a quiet canal in the Jordaan, this hotel puts you within an easy walking distance of most of the sights in the Canal Belt, picturesque Jordaan and Old Center, and even parts of hip Oud-West. Catch a tram from nearby Dam Square to get to the Museum District, or walk to Centraal Station for more options. If it’s comfort food you’re after, La Perla Pizzeria (6-minute walk), is famed for its authentic wood-burning oven Pizza Margherita, and convivial vibe. Sustainable seafood specialist, The Seafood Bar (8-minute walk), offers smoked fish varieties from Volendam, delicately-battered fish and chips, four varieties of oyster and platters of fruits de mer. To try light, modern Dutch cuisine, head to Lt. Cornelis (9-minute walk), which perfectly juxtaposes past and present in its food and décor. Café ‘t Smalle (4-minute walk) has been around since the 18th-century when it was the Hoppe Distillery, and its canal-side terrace is one of the prettiest places to grab a casual beer. And Bar Oldenhof (12-minute walk) offers a wide range of whiskeys and reasonably-priced cocktails (by Amsterdam standards, that is) in a bar with a nouveau-gentlemen’s club feel. For a cozy and comfortable canal house stay, ‘t Hotel offers value for money, and there’s even a cute tea room to relax in.